Would you make a good informatics nurse specialist? Take our career test to find out how you match with this and over 800 other careers. What is an Informatics Nurse Specialist? What is the workplace of an Informatics Nurse Specialist like? An informatics nurse specialist is someone at the forefront of changing technology in the medical world. Often, they act as liaisons between health care providers and technology people in order to allow better decisions to be made based on more accurate data. The paper records systems that have been used by healthcare providers for more than a century are quickly coming to an end. Many informatics nurse specialists are registered nurses, which is key in understanding the workflow as well as the working environment of the various care settings. This role is an essential part of healthcare and a major factor in selecting, implementing, and evaluating health IT that promotes safe, high quality, patient-centric care. For nurses with an interest in technology and for improving patient care, becoming an informatics nurse specialist may be a good career fit. 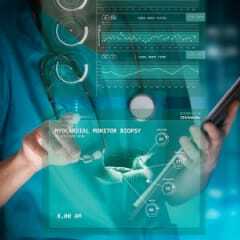 Nursing informatics is a well-established specialty within nursing. The American Nurses Association defines the position as "overseeing the integration of data, information and knowledge to support decision-making by patients and their healthcare providers." Technology is now at the point-of-care in hospitals and nursing homes - from electronic medical records and barcoded medication administration, to physiologic monitoring and 'smart' IV pumps and beds. Informatics nurse specialists are able to choose an appropriate system; provide systems preparation, development, optimization and maintenance; write policies; train and provide support to systems users; perform quality control; and even sales. They are also involved in educating other nurses and promoting professional development. Compliance and integrity management - making sure organizations are meeting all the national laws and standards such as HIPAA, FDA, Joint Commission, etc. Are you suited to be an informatics nurse specialist? Informatics nurse specialists have distinct personalities. They tend to be investigative individuals, which means they’re intellectual, introspective, and inquisitive. They are curious, methodical, rational, analytical, and logical. Some of them are also social, meaning they’re kind, generous, cooperative, patient, caring, helpful, empathetic, tactful, and friendly. Does this sound like you? Take our free career test to find out if becoming an informatics nurse specialist is right for you. Informatics nurse specialists are needed in areas of public health, primary care, pharmacology and intensive care. They work for hospitals or healthcare systems, in academic settings, for vendors, or in consulting. As this career grows, so do the number of opportunities for those interested in this field of nursing.